Personal Finance Can Be Fun!Eliminate The Muda! Personal Finance Can Be Fun! Growing up, I was told that it is not polite to talk about money. If you can’t ask about your parent’s income, you can’t ask about how they save or invest. Without guidance from my parents and the benefit of a mentor I had to figure it out on my own. With my kids, understanding personal finance is a priority. They learned to always save 20% before they learned how to cut meat with a knife. Well, we are still working on the cutting thing :-). I have written previously of the need for personal finance education in public education. I was surprised to learn that 21 states currently require some level of personal finance education in their public schools. However, based on experience in our state, there is little doubt that your kids deserve and need much more. Learning how to fill out a check is simply not enough! It is never too early to begin teaching children. As soon as possible give them a chance to earn their own money and spend it as they see fit, AFTER they have paid themselves first! Let your children be a part of conversations about the family budget, get their help finding smart purchases at the grocery store and share with them how you are taking steps to plan for your long-term financial future. Seeing personal finance as a part of everyday life is one of the best ways to teach your children. But if you are looking for some additional help, there are options on-line. Below are several financial education games that I have come across over the past few months. Practical Money Skills – Exciting graphics with a range of skill levels to choose from. I played the soccer game. After picking the nation you want to represent the player kicks off. As your team member moves up the field it stops and gives you the opportunity to pick easy, medium or hard questions. Answer them right and you continue to progress towards the goal. Answer wrong and the other team just might steal the ball! Moneytopia – It starts off easy enough, time is passing while you earn and spend. This is a complex game so begin by reading the instructions. When I played, I started by choosing to live in my parents garage as a hermit. I figured I’d make my goal without a problem. But like real life the unexpected happens. You find yourself with a wife and kids in broken down car and parking tickets to pay. Before you know it all your hard work gets sucked out of the bank. Of the games I reviewed this is the most complex, most challenging but also the most realistic. If your teen has the patience this might be enlightening. Adds It All Up – This site has a variety of games to choose from. Some are quite simply, somewhat like the game of Life, you move your player across a board based on the number spun. At each stop you have the chance to answer a question; get it right and you move forward, get it wrong and you move back. The drawback with these games is that there is no teaching, just the games. If your kids don’t know the difference between a variable and fixed expense they might figure it out, eventually. CelebrityCalamity – A very engaging game because it has moments of fast action and the challenge of managing the budgets using both debit and credit. What really made this one challenging is that while managing the finances of a celebrity as a manager you also have to balance the challenge of keeping your client happy by catching (buying) lots of stuff! My guess is that this one will appeal to the young girls more. The Great Piggy Bank Adventure – Here is a cute board game that takes on all aspects of personal finance including setting goals and the impact of inflation. This game took a while to load but was well worth the wait. By far the most professionally built in terms of graphics and interaction (made by Disney, no wonder!). However it is best suited for younger kids. Readers: How are you teaching your kids about money? Did I miss any good games, sites or tools that you think should be shared? If you like to be challenged to see things with a fresh perspective, if you like to learn new ideas and different concepts, sign up for my RSS feed or enter your email address here to receive updates directly to your in-box. 7 comments to Personal Finance Can Be Fun! I started out a little to ambitiously with my kids. We played the “Cashflow for Kids” game from “Rich Dad Poor Dad”. It was fun, but a little unrealistic. We have also played “Monopoly”. I’ll have to check out the games you have listed above. They sound like some of them might be more appropriate for my kids. .-= Money Reasons´s last blog ..Stop Waiting For Magical Moments To Happen =-. 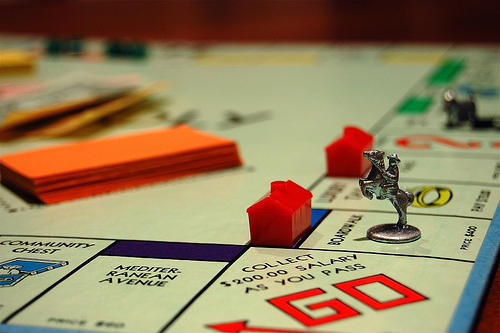 @MoneyReasons – Monopoly has long been a favorite. Sadly, RDPD a trilogy is sitting at home waiting to be read. I look forward to it. I actually relate my money strategy a lot to playing age of empires for the PC. My strategy was always to build as many villagers (income streams) as possible then have enough resources coming in to build a bigger army than the opposing guy. The hardest part was building fast enough so you had some protection before getting rushed (perhaps with debt?) by the other player. Only 21 states? Where did you find that info? .-= Ryan @ Planting Dollars´s last blog ..Hiking Diamond Head and Snorkeling In Waikiki =-. My parent would never share any financial information with me as a kid so I was left to learn my own financial lessons. Because I was always told that we don’t have the money to buy some of the things that I wanted I thought we were poor. Imagine my shock when I applied for college and finally saw that there was no way I could qualify for FAFSA because our family made too much money! These are all great ideas that you shared. @Ryan – You have to be careful, video games as a tool to teach personal finance, I might be convinced to let my son play WoW non-stop! ….. er NOT! @Jane – Thanks for stopping in! – As long as your parents picked up the tab for you I guess it was a blessing in the end…. however, I seem to recall that you have stepped up financially for yourself. Thanks for the links to financial games…I’ll check them out….I work in an elementary school…it has a computer lab..you know where I’m going, right? .-= Ken´s last blog ..How To Properly Work Your Teenager =-. @Ken – That rocks! The thought that I could play some very small part in helping kids learn is what makes blogging worthwhile!!! Please come back and let us know which ones worked best with the kids! Festival of Frugality - How To Eliminate The Muda And Live More Frugally Edition! Money Hackers Carnival #108- Dare and Truth!